orn and raised in Plano, Texas, Eric Franklin stayed in the Lone Star State until he was 22. He moved to Arizona in 1996 to attend Arizona State University where he earned his BFA in sculpture. He's lived and worked in Portland since 2001. Inspired first and foremost by the human body, the physical and psychological experiences Eric Franklin has had as an avid rock climber, in addition to the dramatic settings he's experienced, all contribute to the content of his glass work. "Swell," 12" x 10" x 10"
"I was originally driven to sculpture as a way to make my ideas more concrete and see them in a physical, three-dimensional space," he said. "I think that is still true today, but now there is the added motivation of seeing ideas progress in a long-term, ongoing process. 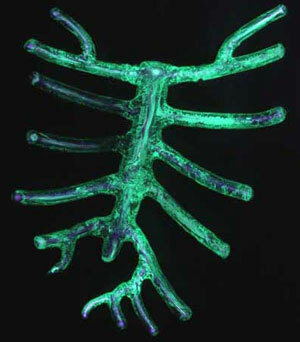 I am fascinated by the processes of plasticity and adaptability and how those affect our lives." 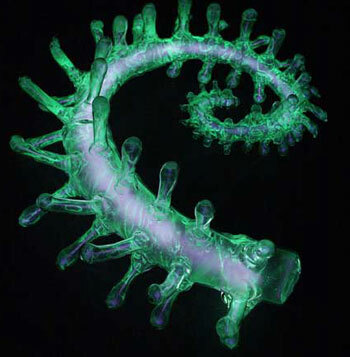 Eric's sculptures are made of flame-worked borosilicate glass. All of the glass he uses begins as straight tubes in various diameters. Once the forms are complete, they are connected to a high-vacuum pump, while heated in a kiln, to evacuate their interior of all air, dust and water vapor in order to create a very clean and contaminant-free environment. 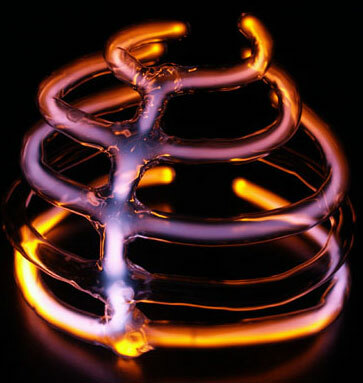 Once all impurities are removed from the interior of the form, the glass is allowed to cool and a small amount of neon or argon gas is introduced. The glass is then sealed and removed from the vacuum system. In most of the pieces the forms are placed in close proximity to a high-voltage high-frequency power antenna, contained in the base, to produce the illumination. "Glass forms express light in different ways due to their physical architecture as well as the employment of a living body's electromagnetic field," he said. "This dynamic relationship generates a dialogue of creative interaction." "Spiral," 6" x 18" x 15"
Eric's childhood days were spent in two completely different ways: either quietly, sitting and drawing on reams of used computer paper his dad brought home from work and building structures and spaceships with Legos, or he would charge full speed around the house, yard and neighborhood on foot or bicycle. "I've always enjoyed extremely physical activities and to be able to combine that with an artistic process just made sense," he said. Eric took whatever art classes were available in school, including an intensive drawing class his senior year of high school. At Arizona State his studies bounced from subject to subject before he eventually found his way back to art. "It's kind of odd how it worked out though," he said. "I've always had an interest in glass. Before I knew much about glass it was the process that seemed most appealing. But I had a really hard time finding off-hand glassblowing classes in Arizona. I guess it makes sense that when it's 115 degrees outside nobody wants to stand in front of a hot furnace. I eventually found a weekend glassblowing workshop and probably did more off-hand blowing that weekend than I've done since. It's just never been very accessible." 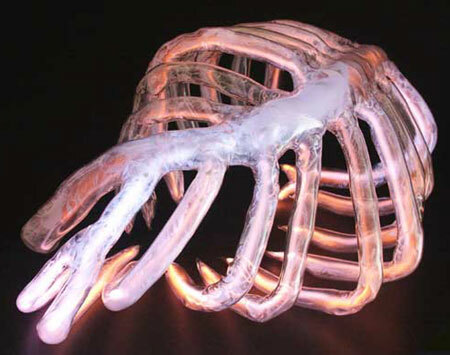 "Thorax," 11" x 24" x 15"
The neon shop within the sculpture studio at ASU was where Eric really started working with glass. His first assignment was to make an outline of his hand with one continuous tube. He never completed the assignment. "I stayed at the studio every night until 3 a.m. for at least three weeks trying to make that piece, but it always cracked, sometimes exploded, before I finished. It was the most challenging material I had ever worked with. I guess that's what intrigued me the most because I just kept at it." Eric eventually had success with some neon that was a little more straightforward. Later in the semester he was trying to blow some small forms using the neon glass and fires. When his professor saw what he was attempting, he told Eric there was a better way and sent him to the scientific glassblowing shop in the chemistry department where they produced and repaired the glassware used in scientific research. "Rings," 2" x 15" x 15"
"Just walking in the door for the first time and seeing some of the things they had made on the shelves I knew I had found the right place," he said. 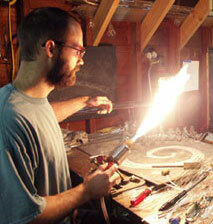 "The glassblower, Mike Wheeler, took me in and shared all his knowledge about glass. I took one of his glassblowing classes and he always let me come into his shop and work. "As well as an expert in glassblowing, Mike is an expert in high vacuum systems. He eventually helped me make my neon vacuum system that I still use to fill all my glass forms with gas. "Because of his in-depth knowledge in principle he was able to provide me with a thorough understanding of the science behind what is occurring inside my glass pieces." 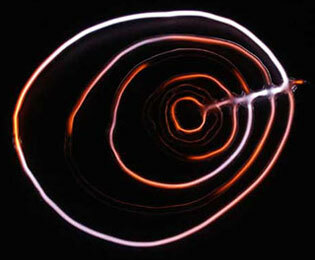 Eric's favorite artists include James Turrell, Alexis Rockman, Mark Zirpel, Jim Campbell and Tim Hawkinson. "Sprawl," 20" x 15" x 6"
Eric organized and curates this month's show at Portland's new Guestroom Gallery, 128 NE Russell, under the Wonder Ballroom. The show, glassmateria, also includes the work of Mel George, Erika Kohr, Helen Otterson and Pat Bako. His glass work is also on view through April 9 in a solo exhibition, "The Cognitive Body," at the Museum of Northwest Art in La Conner, Wash.
Eric recently joined the Laura Russo Gallery and will be part of an all-gallery group show there in October for the gallery's 20th anniversary. Eric's honors include an artist-in-residency at the Oregon Museum of Science and Industry and inclusion in NuArt '05: Juror's Choice at the Anacortes Arts Festival. E-mail Eric at eric@ericfranklin.com and visit his Web site. You can reach Kathy at kanderson138@comcast.net, and draw on other Sketch Pads.